The lime swallowtail, Papilio demoleus Linnaeus, is sometimes called the chequered or citrus swallowtail. This butterfly ranges widely and is an extremely successful invader. Its proliferation appears to be aided by agricultural land use and urbanization that create new, suitable open habitat and enhanced availability of resources. Figure 1. Dorsal view of adult lime swallowtail, Papilio demoleus Linnaeus. Photograph by Delano Lewis, University of Florida. 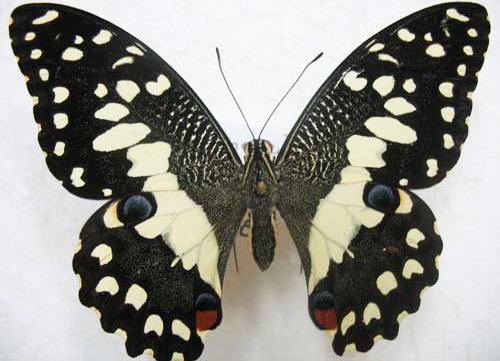 Papilio demoleus sthenelus is found only in Australia and, along with the subspecies in Papua New Guinea, utilizes different host plants than the Asian and African subspecies. The population in the Dominican Republic has been traced to a southeastern Asian subspecies (Eastwood et al. 2006). This species is also morphologically similar to Papilio demodocus Esper from Africa and Madagascar. This species is found throughout tropical and subtropical regions of southern Asia, ranging from Saudi Arabia, Iran and the Middle East to India, Nepal, southern China, Taiwan, and Japan. It is also found in Malaysia, Indonesia, New Guinea, and Australia. In recent years, Papilio demoleus has been recorded in the Dominican Republic, Puerto Rico, and Jamaica. Adults: The adults range in wingspan from 80-100 mm. The hindwing has no tail. The upper portion of the forewing is largely black and the outer wing margin has a series of irregular yellow spots. Two yellow spots are present at the upper end of the discal cell with several scattered yellow spots in the apical region. The upper hindwing has a red tornal spot and the discal black band is dusted with yellow scales. The under side is paler yellow with the black areas more heavily dusted with yellow. The adults fly in every month but are more abundant after monsoons. Figure 2. Ventral view of adult lime swallowtail, Papilio demoleus Linnaeus. Photograph by Marina Young, RADA, Jamaica. Eggs: The eggs are pale yellow, nearly spherical, about 1.5 mm, basally flattened, and smooth. Females lay eggs singly near the edges of the host plant leaves. Figure 3. 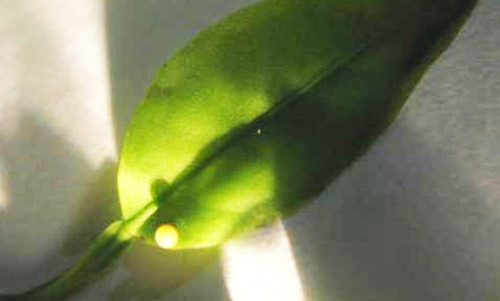 Egg of the lime swallowtail, Papilio demoleus Linnaeus, deposited singly near leaf edge. Photograph by Marina Young, RADA, Jamaica. Larvae:First instars are black with a black head, with two sub-dorsal rows of short fleshy spines. Second, third, and fourth instars have a dark brown, glossy head capsule. The anterior, middle, and posterior parts have broad transverse off-white bands, giving larvae a bird dropping camouflage pattern. There is an additional row of paired fleshy spines on the thorax. The head is brown, smooth and glossy, with short hairs. Figure 4. First instar of the lime swallowtail, Papilio demoleus Linnaeus, on citrus leaf. Photograph by Marina Young, RADA, Jamaica. Figure 5. First instar of the lime swallowtail, Papilio demoleus Linnaeus, on a citrus leaf, showing v-shaped white mark. Photograph by Marina Young, RADA, Jamaica. Fifth instars are cylindrically shaped and tapered anteriorly. Two pairs of fleshy spines are located posteriorly and again immediately behind the head. These spines are very short, and gradually change from yellowish-orange to green. They have rows of orange or pink spots edged with black laterally and subdorsally with black transverse markings located anteriorly, with more scattered black markings laterally and at the rear end. There is a white sub-lateral line along the abdominal area just above the legs. The fleshy spines are orange. The head is large and brown with a dull orange inverted V mark. Figure 6. 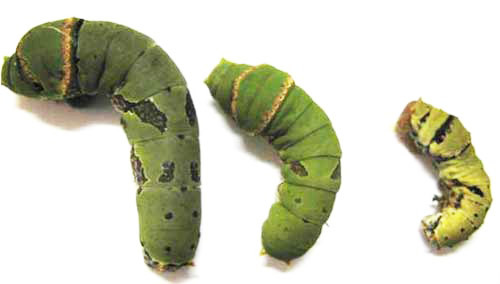 Third (right), fourth (center) and fifth (left) instars of the lime swallowtail, Papilio demoleus Linnaeus. Photograph by Marina Young, RADA, Jamaica. The osmeterium is yellow at the base to orange at the tips. 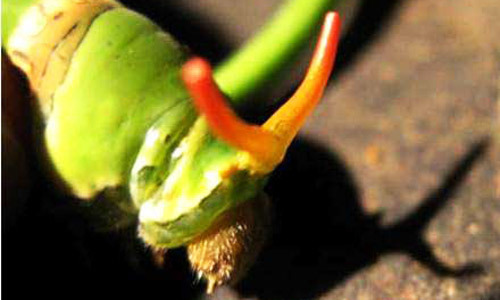 This fleshy, forked structure is located on the head of the larvae of swallowtail butterflies. It is normally hidden but can be everted when the caterpillar feels threatened. It emits smelly compounds that deter some predators. Figure 7. 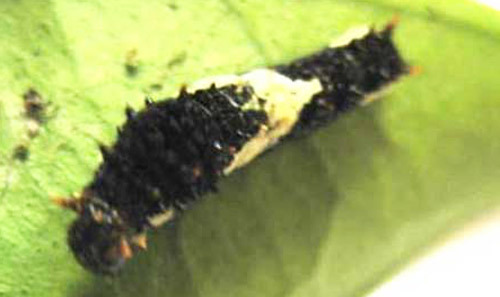 Larva of the lime swallowtail, Papilio demoleus Linnaeus, with the osmeterium exposed. Photograph by Marina Young, RADA, Jamaica. Pupae: The pupae are stout, rugose, and about 30 mm long. They are attached to the thicker stems of the host plant, or to adjacent sticks and rocks. The color is dimorphic, typical for many swallowtails, being either pale green or pink-brown with other variable cryptic markings. The green form is usually marked dorsally with yellow. The color pattern imitates the dominant surrounding color to which the pupa is attached. The pupal duration is variable. In some areas, it is about 30 days in spring, reducing to 18 days in summer, but often those pupae formed in captivity during autumn will not produce adults until the following spring, or even longer with one record of 280 days. Figure 8. Pale green pupa of the lime swallowtail, Papilio demoleus Linnaeus. Photograph by Marina Young, RADA, Jamaica. Figure 9. 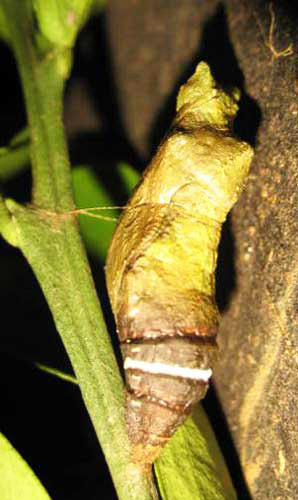 Pink-brown pupa of the lime swallowtail, Papilio demoleus Linnaeus, showing white band. Photograph by Marina Young, RADA, Jamaica. This species typically has five instars and is capable of producing multiple generations per year depending on temperature constraints. Near the equator as many as nine generations may be seen. The average length of a generation varies from 26 to 59 days. In colder climates, pupae may overwinter. Outside of Australia and New Guinea, Papilio demoleus feeds on plants in the Rutaceae family. It is known to feed on virtually all species and varieties of native or introduced citrus (including cultivated Citrus species), Glycosmis pentaphylla (Jamaica mandarin orange), Ruta graveolens (common rue), Aegle marmelos (golden apple), Murraya koenigii (curry-leaf tree), and Chloroxylon swietenia (East Indian satinwood). Papilio demoleus has been observed ovipositing on Citrus aurantium (bitter orange), and Citrus aurantifola (Key lime, Mexican lime, West Indian lime) (Common and Waterhouse 1972, 1982; Tsukada and Nishiyama 1982; Larsen 1984; Braby 2000; Rafi et al. 1999a; Rafi et al. 1999b; Rafi et al. 1999c; Rafi et al. 1999d). The potential suitability of additional cultivated and native New World Rutaceae including plants in the genera Amyris, Ptelea, and Zanthoxylum is unknown. The Australian and New Guinean populations feed on Fabaceae. They have been observed on species of Cullen (=Psoralea): Cullen australasicum (tall verbine), Cullen badocanum, Cullen balsamicum, Cullen cinereum, Cullen patens (spreading scurf-pea), Cullen pustulatum, Cullen tenax (tough scurf-pea), and Cullen leucanthum. They are also found on Soralea pinnata (fountain bush), and Microcitrus australis (Australian lime). They are known to oviposit on Rutaceae: Citrus aurantium (bitter orange), and Citrus aurantifola (Key lime). 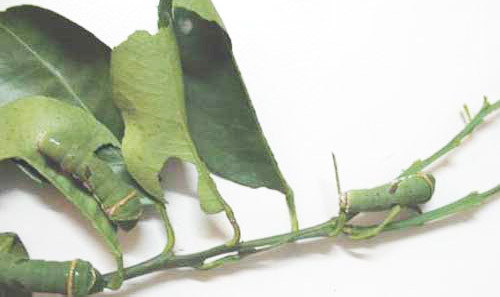 The New World arrival of this vagile lepidopteran pest is a potential threat to the citrus industries in the region. The larvae are a serious pest of citrus nursery stock (trees 1-2 ft. in height) and other young citrus trees in Asia and the Middle East, where they are capable of defoliating entire nursery groves. Larvae may utilize young leaf flush on more mature trees. Figure 10. 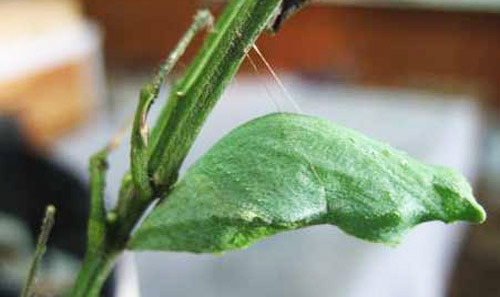 Larval feeding of the lime swallowtail, Papilio demoleus Linnaeus, damages the host. Photograph by Marina Young, RADA, Jamaica. Biological control. 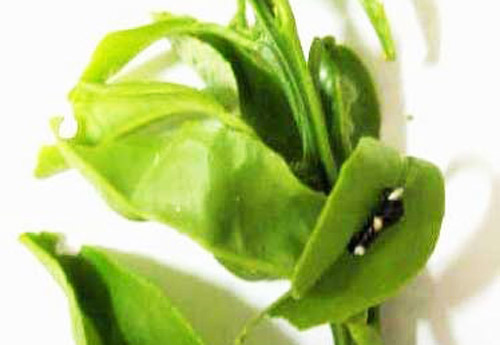 Three parasitoids are known to parasitize Papilio demoleus larvae in India. They are Apanteles (=Ooencyrtus) papilionis, Apanteles sp. and Bracon hebetor (Hymenoptera: Braconidae). In Thailand, two kinds of egg parasites were found: Ooencyrtus malayensis Ferriere (Hymenoptera: Encyrtidae) and Tetrastichus sp. (Hymenoptera: Eulophidae). A larval parasite, Erycia nymphalidophaga Baronoff (Diptera: Tachinidae), was found. Additionally, Brachymeria sp. (Hymenoptera: Chalcididae) and Pteromalus puparum Linnaeus (Hymenoptera: Pteromalidae) are pupal parasites. Other natural enemies of larvae found in Thailand were a predatory pentatomid bug, Cantheconidea furcellata (Wolff), reduviid bugs, spiders, sphecids, chameleons, and birds. In Jamaica, an encyrtid egg parasitoid and a chalcidoid parasitoid have been reported. The biopesticides Bacillus thuringiensis and Beauveria bassiana, as well as neem seed kernel extract and azadirachtin were shown to have effects on Papilio demoleus in India. Bacillus thuringiensis showed the highest level of control. Other natural methods of control. Larvae are easily hand-picked from nursery plants, but this practice is labor intensive if infestation is high. Braby MF. 2000. Butterflies of Australia: Their identification, biology and distribution. Volume 1. CSIRO Publishing. Common IFB, Waterhouse DF. 1972. Butterflies of Australia. Angus and Robertson Publishers. Common IFB, Waterhouse DF. 1982. Butterflies of Australia. Angus and Robertson Publishers. Eastwood R, Boyce SL, Farrell BD. 2006. The provenance of Old World swallowtail butterflies, Papilio demoleus (Lepidoptera: Papilionidae), recently discovered in the New World. Annals of the Entomological Society of America 99: 164-168. Garraway E, Murphy CP. Unpublished manuscript. First record of Papilio demoleus (the Lime Swallowtail) a potential pest of citrus, on Jamaica. Dated October, 2006. Guerrero KA, Veloz D, Boyce SL, Farrell BD. 2004. First New World documentation of an Old World citrus pest, the Lime Swallowtail Papilio demoleus (Lepidoptera: Papilionidae), in the Dominican Republic (Hispaniola). American Entomologist 50: 227-229. Homziak MT, Homziak J. 2006. Papilio demoleus (Lepidoptera: Papilionidae): A new record for the United States, Commonwealth of Puerto Rico. Florida Entomologists 89: 485-488. Larsen TB. 1984. The zoogeographical composition and distribution of the Arabian butterflies (Lepidoptera; Rhopalocera). Journal of Biogeography 11:119-158. Rafi MA, Matin MA, Khan MR. 1999a. Number of generations and their duration of the lemon butterfly, (Papilio demoleus L.) in the rain fed ecology of Pakistan. Pakistan Journal of Scientific Research 51(3-4): 131-136. Rafi MA, Khan MR, Matin MA. 1999b. Temperature dependent development and prediction of the life stage of Papilio demoleus in the field. Pakistan Journal of Scientific Research 51(3-4): 146-150. Rafi MA, Matin MA, Khan MR. 1999c. Biology of eggs of citrus butterfly, Papilio demoleus L. (Papilionidae: Lepidoptera). Pakistan Journal of Science 51 (3-4): 95-99. Rafi MA, Khan MR, Ilyas M. 1999d. 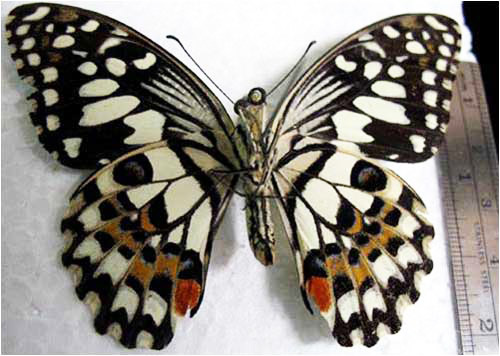 Host preference of lemon butterfly Papilio demoleus L. in the northern Barani areas of Pakistan. Pakistan Journal of Science 51(3-4): 93-94. Sherwood M, Myers L. 2008. Lime Swallowtail, Papilio demoleus (Lepidoptera: Papilionidae). Entomology Circular, Ministry of Agriculture, Research and Development Division, Jamaica. Tsukada E, Yasusuke N. 1982. Butterflies of the South East Asian Islands. I. Papilionidae. Plapac Co. Publication Date: December 2008. Latest revision: April 2015. Reviewed: April 2018.